I’m pleased to announce two in-person training dates in London next year. My star rating measure from this blog post has been turned into a Quick Measure! My name is in Power BI! I am so chuffed! The important thing here is that this is the first example of a calculation submitted to the Quick Measures Gallery making it into the product. Drillthrough pages and bookmarks will revolutionise how we can navigate through a Power BI report, and turn Power BI into a true data storytelling tool, and are really exciting. The session on the Visio custom visual for Power BI had a lot of detail on how Visio/Power BI integration will work, and was very impressive. You can sign up for the preview here. 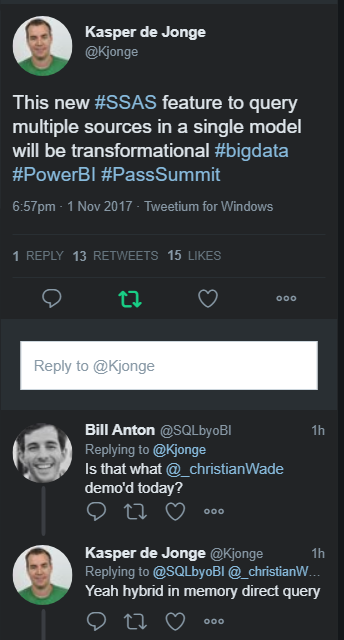 Power BI/PowerApps/Flow integration, with Power BI content appearing in Power Apps and vice versa is something I am going to watch with interest. Matt Masson’s session has a lot of information on building custom data connectors as well as the announcement that M is officially called M! Azure Analysis Services will soon have a much better web interface that will allow you to create simple models, and also to import models from Power BI .pbix files. Christian Wade’s session on Azure Analysis Services also has a great extended demo showing off new SSAS Tabular features, including one showing using BISM Normalizer to merge parts of a mode in a .pbix file into a Tabular model. This is by no means comprehensive. I haven’t been able to watch all the videos yet either, so there may be other important new features in other sessions that I completely missed. Last of all, although they don’t contain any new announcements, you can also watch my two M-themed sessions from the conference: Working With Parameters And Functions and Working With Web Services in Power BI/Power Query/Excel Get&Transform.